By efficient management, the sustainable exploitation of resources in oceans, seas, lakes and rivers - also known as the blue economy - could contribute up to $1.5tn to the global economy. That was the consensus of thousands of experts, government officials, environmental activists, policymakers and academics who converged in Nairobi, Kenya in November for the Sustainable Blue Economy Conference. 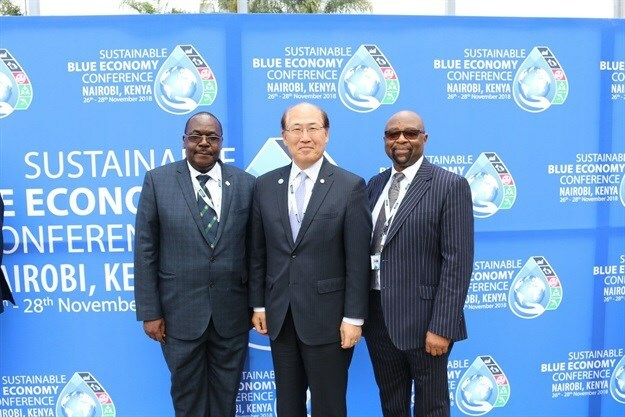 With the theme “Blue Economy and the 2030 Agenda for Sustainable Development,” the conference, convened and hosted by Kenya, with Canada and Japan as cohosts, looked at new technologies and innovation for oceans, seas, lakes and rivers, as well as challenges, potential opportunities, priorities and partnerships. Africa has 38 coastal and island states and a coastline of over 47,000km, and hence presents an enormous opportunity for the continent to develop the sectors typically associated with the blue economy, says Dr Cyrus Rustomjee, a blue economy expert and a senior fellow at the Centre for International Governance Innovation. “Expanding fisheries, aquaculture, tourism, transportation and maritime and inland ports can help to reduce African poverty and enhance food and energy security, employment, economic growth and exports, ocean health and sustainable use of ocean resources,” says Rustomjee. He notes that more than 12 million people are employed in fisheries alone, the largest of the African blue economy sectors, providing food security and nutrition for over 200 million Africans and generating value added estimated at more than $24bn, or 1.26% of the GDP of all African countries. Of concern at the Nairobi conference was the current wanton and large-scale exploitation of the world’s waters, especially in developing countries. President Uhuru Kenyatta of Kenya expressed concern over the “massive pollution of our water bodies; the evident overexploitation of water resources and their related biodiversities, as well as the specific challenge of insecurity, more so in the high seas”. Pre-conference advocacy by Kenya, Canada and Japan, the main organisers of the event, focused on many issues central to Africa’s development, including food security for vulnerable groups and communities, malnutrition, sustainable food production and gender equality in blue economy industries. Kenya’s foreign affairs cabinet secretary Monica Juma said the discussions were “dedicated to realising the untapped potential found in our oceans, seas, lakes and rivers; and focused on integrating economic development, social inclusion and sustainability which promotes a blue economy that is prosperous, inclusive and sustainable”. While emphasising the importance of unlocking the full productive potential of Africa’s waters, Juma said she especially hoped to see increased participation of women and youth in all areas of the blue economy. A recurring theme at the conference was that the blue economy could boost a country’s economic growth and environmental protection and, by extension, help achieve the Sustainable Development Goals of the 2030 Agenda. According to Macharia Kamau, the principal secretary in Kenya’s Ministry of Foreign Affairs, overall the conference presented “immense opportunities for the growth of our economy, especially sectors such as fisheries, tourism, maritime transport, offshore mining, among others, in a way that the land economy has failed to do”. The strategic importance of the blue economy to trade is clear, notes the International Maritime Organization, a specialised agency of the United Nations responsible for regulating shipping. For instance, up to 90% of global trade facilitation by volume and 70% by value is carried out by sea. One challenge is that the oceans and seas absorb about 25% of the extra carbon dioxide emissions added to earth’s atmosphere through the burning of fossil fuels. Oil and gas remain major sources of energy, with approximately 30% of production carried out offshore. Before the event, the organisers highlighted current challenges within the blue economy, including a lack of shared prosperity, maritime insecurity and unsustainable human activities around and in oceans, seas, lakes and rivers, including overfishing. Other challenges are pollution, invasive species and ocean acidification, which lead to biodiversity loss and compromise human health and food security. In addition, a weak legal, policy, regulatory and institutional framework and poorly planned and unregulated coastal development exacerbate existing challenges. To address these problems, participants called on leaders and policymakers to implement appropriate policies and allocate significant capital to sustainable investment in the sector to boost production, inclusiveness and sustainability. The Nairobi conference drew global attention to the blue economy, the challenge is ensuring concrete actions follow the vigorous discussion. Article published courtesy of Africa Renewal.